I've been on a baking kick lately (thanks in part to my beautiful blue kitchen aid) and I'm finding some pretty creative recipies online. 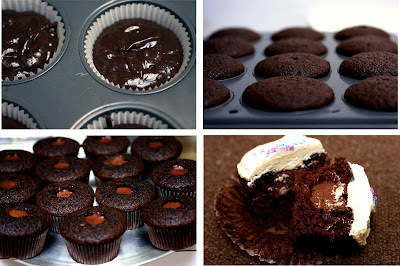 This mouthwatering 'Irish car bomb' cupcake recipe combines two of my favorite ingredients... chocolate & booze. Wouldn't they make a yummy birthday surprise for the man in your life? Just make sure he's legal. When the frosting looks thick enough to spread, drizzle in the Baileys (or milk) and whip it until combined. If this has made the frosting too thin, beat in another spoonful or two of powdered sugar. I made this for a friend's beer tasting birthday party - what a hit! and there was plenty of extra liquored up frosting... yummmmmmmmm!